Missouri high school social studies teacher @Bethany_Petty posted a creative idea for integrating technology into primary source learning that she dubbed as Hashtags Through History. Here is a brief overview from her blog Teaching with Technology. This activity requires students to locate an image that depicts a historic event, create a username for a person that lived through the event, describe the event as that person would in 50-100 words, and create relevant and appropriate hashtags for their post. Students then locate an article that provides additional information about the event, create a QR Code that links to that article, and paste the QR Code on their post. 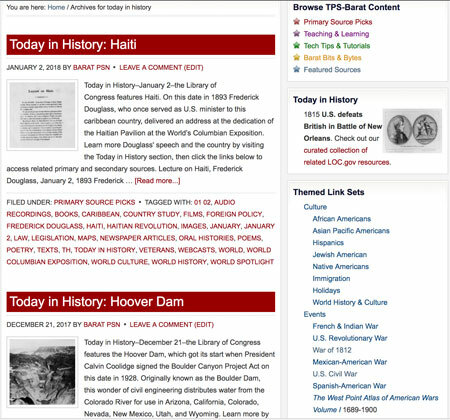 This would be a great activity to use with our Today in History posts featuring links to background information and primary sources from the Library of Congress. These posts feature people, places, and events from history. Students can scroll through the extensive list (there are nearly 500!) or they can search on a particular day by typing in a URL such as http://primarysourcenexus.org/tag/01-09/. To alter the date, simply change the double numbers for month-day. #Hashtags through History Thanks for the inspiration Bethany!